I played this at a 5-player table on Tier 3-4. The scenario had so much potential--an opportunity to learn about the kasatha, solarians, the Idari, and Jadnura? Yes, please!--but it flopped at the end. The tea house was fun, even playing a -2 Charisma penalty dwarf. The lost ruin was interesting and eerie. The boss battle was way too much and didn't fit the story that was billed nor the story that was being set up during the scenario. Then when you get to Jadnura, the scenario ends with, "Thank you for rescuing me. I will return." I would have better enjoyed the tea house as it was, a more fleshed out and pertinent temple encounter, the creepy ruined temple in outer space with its psychic traps, meet Jadnura, use the lessons learned at the tea house and temple to convince him that he needed to return to the Society, and then be attacked by a rogue faction within the Society that believes it would be better for the Society for Jadnura to never have returned and used the PCs to track him down. EDIT: I did not explore the Idari as billed in the product description. I did not learn the history of Jadnura as billed in the product description. Let me start by saying this is a hard scenario. It features a lot of social encounters where your actions matter, tricky traps, and difficult battles. In this scenario PCs need to navigate their way through the Kasathan home-ship and track down First Seeker Jadnura, all while dealing with the vastly different cultural traditions around them, and (hopefully) not offending anyone too badly. This scenario does a wonderful job of immersing you in a unique, serene sort of culture with strong Asian and Middle Eastern influences. It was engaging, fun, and wonderfully handled. Vastly different than the frantic, high-tech, fast pace of most scenarios, your players time on Idari is sure to throw some players for a loop. Characters who have social skills will definitely excel in this part of the adventure, but its not only skill, but clever roleplaying that’s necessary to make progress here, so even the most awkward of characters can be helpful if they try. Personally, I felt the the entire time on Idari was wonderfully handled and a real highlight of the scenario. That said, some groups may find it tedious. Its not the kind of scenario where being boorish will see you through. You need to try to follow the local customs. In time the PCs will need to fetch Jadnura. The place he's located has a wonderful atmosphere, but other than that I’ll leave this part of the scenario a mystery for the moment. As for battles, I particularly enjoyed the first one. It has opportunity for roleplaying with your opponents, and your actions can have an obvious effect on the battle. Tactics and morality matters in this one, which is always a nice change of pace. Later battles have more straight-forward enemies — not so much in mechanics, but in roles. They are clearly enemies, and you are heroes for taking them on. The final battle is incredibly challenging. Like, REALLY freakin' hard. We're talking a much higher CR fight against an incorporeal opponent who has solid tactics and maneuverability on their side. Many groups will be completely unable to deal with an incorporeal enemy, so GMs running this scenario for such groups will want to drop some hints earlier (either in or out of character) so they can ensure they have appropriate gear. This scenario also featured some flavourful psychological/magical traps which could be tough for some groups. Overall, I thought this was a fun adventure. I particularly enjoyed how well it immersed us in Kasathan culture. That said, unprepared groups (which will be most of them) will find the final battle too difficult, while other groups may find the social interactions tedious. I had my ups and down...almost died 4 times. From a player perspective, this scenario was one that will forever stick with me. We had a good mix of level 3 and 4 characters: a soldier, a vanguard, 2 operatives, a biohacker, and a mystic. Well we started out pretty well gathering information and making small talk. We also did pretty well in the combats except for the final boss. I won't reveal too much but after 6 rounds of combat, the GM pulled back the curtain to show us it's health bar. WOW. Ok then, maybe we aren't meant to win or maybe there is something we missed. Well you are supposed to just straight up fight it. Was there still fun to be had? Honestly, besides the jokes made over discord, the only positive feeling I had was we all were able to run away. I guess I should be happy to encounter that enemy and live to tell the tale. I went unconscious 4 times in that last fight. My resolve points were reduced to 0 so I had no resolve to stabilize because game mechanics. There were discussions about leaving me behind because all hope was lost. I kept my mouth shut because I was unconscious so I had to start counting my fame for a raise dead spell. Thankfully someone found a way to give me a chance to get out. I'd give them fame points if I could because they earned it. Thank you little biohacker for saving my life, 4 times in a row, over 4 consecutive rounds while everyone else attacked like crazy to no avail. The creature would not leave me alone for some reason. All in all, this adventure seemed like it was 2 separate ones spliced together. I can't imagine how this fight should go down in the level 3-4 bracket. I honestly couldn't GM this scenario ever after seeing the enemy waiting at the end. I would feel too guilty but again, I gave it 2 stars instead of 1 because it really opened my eyes to lvl 3-6 scenarios and I'll stay in the 1-4 bracket for as long as possible. The problem with this scenario cannot be addressed without spoilers, read at your own risk. The last encounter is a CR 7 Incorporeal creature. Against a party of 3-4th level pc's who do not have the ability to damage it consistently. The only weapon in the game that does force damage is in an adventure path book and it only works for strength based characters. The ghost killer fusion is still out of sight for level 3 characters and not on the mind of level 4 ones. And not every single party if coing to consist of two melee sponges and four technomancers with nothing but magic missles at the ready. 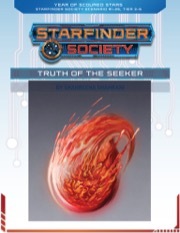 It is not like pathfinder where magical weapons are an instant investment, and countermeasures against every single type of creature are abundant, due to an extensive library of single subject splatbooks. It hits extremely hard and has very hard to resist wisdom damage on its attacks, wich are basically an auto hit everything except a full ac focused Vesk vanguard fighting defensively. Oh and it can spend a resolve to massivly increase this wisdom damage. AND IT FLIES. The writer needs to understand that putting starfinder characters against apl+3 is extremely challenging of itself, adding incorporeal is just flipping a metaphorical bird. I ran this scenario, and I tried my best to make it look good. But quite frankly, it doesn't measure up to the high standard set by other scenarios in this season. I was hoping this scenario would do a couple of things: show off the Idari and give us an idea of who Jadnura is. Sadly, it does little of either. We're put on a railroad on the Idari, spend most of our time talking to a lashunta about how we will be talking to a kasatha later on, and then it turns out there's really not much to talk about with the kasatha. Then there's a pointless fight and we're off again. The whole investigation really isn't one, it solves itself. We go to a place that should be an amazing set piece, but there's no description at all. 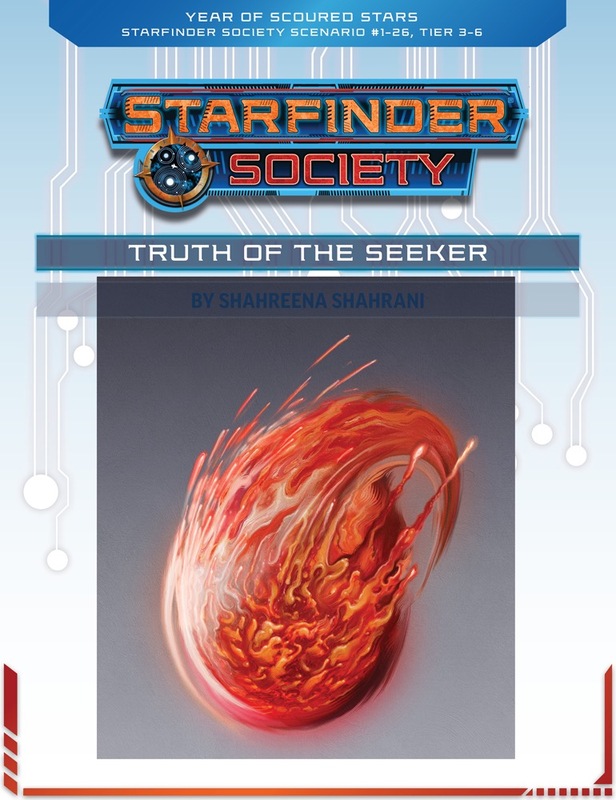 We fight a monster with an ability that seems to have become weirdly powerful in the transition from Pathfinder to Starfinder, but is otherwise mostly a nuisance. Then we get to a genuinely cool place, and face a boss that's way over the top. And if you succeed at all that (and my players didn't) you take Jadnura home. I feel this scenario really wastes the opportunity to explore the Idari (which could have easily been one or more adventures on its own). Which is sad because I don't know if we'll get another opportunity for a long time, now that it's had its turn. This is also the second time we meet Jadnura only for him to immediately get shuffled off-stage because the act is over. Third chance for a second impression? Oh man, I have got to play this one as my Scoured Stars Survivor character! I've got questions about part B and C.
In the optional encounter part B, is there no four player adjustment for the solar wisp fight? In part C, is it assumed the interior of the temple has atmosphere? I can't imagine that Jadnura's plan was to meditate at the temple for a few weeks while residing entirely in his environment suit. You might want to ask those kinds of questions in the GM discussion thread. Thank you for the direction and the link, it's much appreciated.